It's our First Birthday and we want to celebrate with you!! If you're here to get your party on, you're in the right place! We are super excited for the new team of Girl Fridays to officially make their inspiration parade debut, and we have all sorts of fun and surprises in store for you this week! Which gift should we give to our players in honor of our first birthday? aw what the heck... it's our birthday, and presents rock, so let's do them all!!! 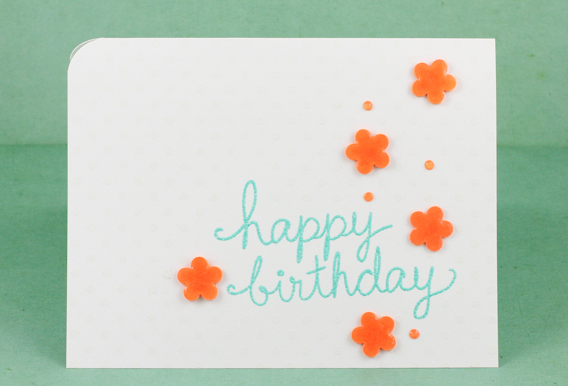 Clean And Simple Birthday creations! Starting this week, the challenge will now run through noon on Thursdays giving you an extra 12 hours to make the deadline! but will also earn a guest spot with the Girl Fridays for the June guest challenge! This week, because it's our birthday, our four VIP's will win this super fun stamp set from Simon Says Stamp called Savor Sweet Cupcakes!! Be sure to comment on the daily inspirations featured on the facebook page- One random comment will also win this darling stamp set from Simon Says Stamp! AND, to keep it fair for everyone who isn't on facebook, one random comment on this blog post will win this set too! And now...it's time for our inspiration parade featuring the new team of Girl Fridays, and led by our fabulous guest! All things paper make me happy! 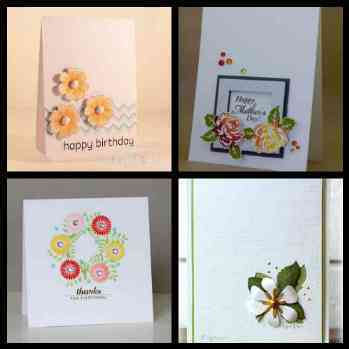 I am a stamper and card maker with a passion for 3D paper crafts. Origami was my entire craft life until I discovered stamping in mid 2011. I love trying out new techniques and new tools. Also starting this week, we will have new daily inspiration for you on our facebook page provided by none other than our fabulous new facebook team!! We are delighted to have a very special guest joining us to help kick off the facebook team! 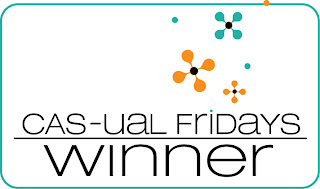 Let's hear it for the winners from last week!! Congratulations on your first year and wishing you many, many more! Happy Birthday CAS-ual Fridays!! Thank you for the fun and inspiration!! Lovin' all those birthday cards! 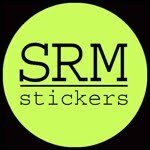 I love the challenges on this blog! Happy birthday to you!! I love the time addition as well as the added opportunities to win! Thank you. Happy Birthday, CAS-ual Fridays! Here's to many more! Happy birthday! All of you made such beautiful cards! Hope to see many more of your inspiring work cause it´s really hard for me to keep it clean & simple. Happy 1st Birthday CASual Friday and welcome to the new team - loving your first inspiration parade. Happy happy birthday and a big thank you Michele! So happy to be part of all the fun!! It's celebration city over here and what a wonderful inspiration parade! Congratulations on a year of fabulous challenges - has it really only been a year?! Love Dana's patterned balloons and Julie's terrifically CAS scored border. Happy Birthday! Love the birthday cards from the DT, great ideas! Happy birthday! What a great year it has been and can't wait to play this year! Happy Birthday! Congrats on 1 year. Enjoy your challenge and thanks for the extra time. HAPPY BIRTHDAY! I love this site and hope you continue to inspire all of us lucky viewers for years to come. Happy 1st Birthday!!! Love the loads of inspiration from the DT and the extra time for the challenge! Congrats to last week's winners - fab creations ladies! 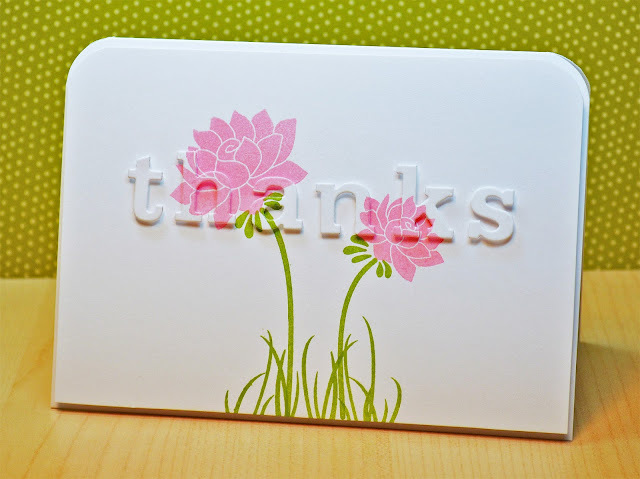 Thanks so much for choosing my card!!! You all made my week:). Congrats to Tamara, Ange, Michelle, and Birgit! Amazing stuff! Last but not least, a big "Happy Birthday" to CAS-ual Fridays!!! I'm so looking forward to playing along with the new design team and facebook team! Happy Birthday! I love all of the design team's cards! Happy Birthday! Can't wait to see what is in store for the next year to come! happy birthday to youuuuuu! and thank you for the challenges you propose. You're amazing! Congrats to the VIPs and JJ on your fabulous win! Such beautiful cards! Happy Birthday and wishing you many more fun-filled years to come. Love the birthday inspiration from the design team. Hope you all have a wonderful weekend! What some great Birthday inspiration. Can't wait to get started. Happy Birthday ladies! Wishing you another awesome year! and congratulations to all winners from last week! Happy Birthday! Love this challenge and all the inspiration from the design team each week! Happy Birthday! What a fantastic new team, the inspiration is incredible!!!! You guys totally ROCK! Happy Birthday and thanks for the great gifts! Wow, quite the BIRTHDAY celebration! I hope to find the time this w/e to enter a birthday card, but if not, I'll enjoy all the inspiration. 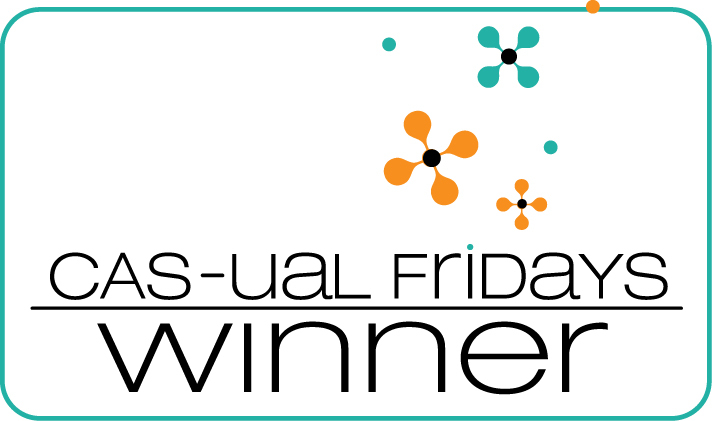 Congratulations, CAS-ual Fridays! Happy birthday ladies! Thanks for a year of challenges and inspirations! This was such a fun blog this year, can't wait for another year of great inspiration! Happy Birthday, and here's wishing for many more!! Congrats to all of last week's VIPs-all the floral cards are beautiful! LOVE, LOVE LOVE JJ's technique and have had a lot of fun trying it. Perfect choice for the winner! Happy Birthday!!! 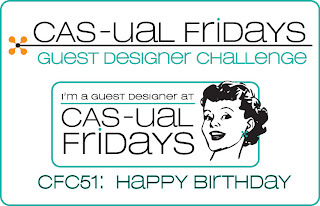 I love CAS-ual Fridays blog and challenges. The challenges are always fun and the DT inspiration is awesome! I love your weekly challenges, and I really, REALLY love your weekly inspiration. I have so many of your cards saved to my inspiration file! Thanks so much! Happy Birthday! Happy Birthday to you!!!! Love your challenges and all of your DT inspiration!!! Can't wait to join in on this fun too! Love all the challenges u have made us addicted to ! Wow, Happy Birthday! Gorgeous cards! Thanks for sharing! Happy Birthday, CAS-ual Fridays! Love the DT's samples, and thank you for extending the deadline! Here's to many more years of CAS fun! Happy Birthday to you CAS Fridays! Thanks for sharing some birthday gifts with us as well. Happy Birthday CAS-ual Fridays. It's been so much fun to come and challenge myself here whenever I can. Thanks for inspiring all of of us. Happy Birthday girls! 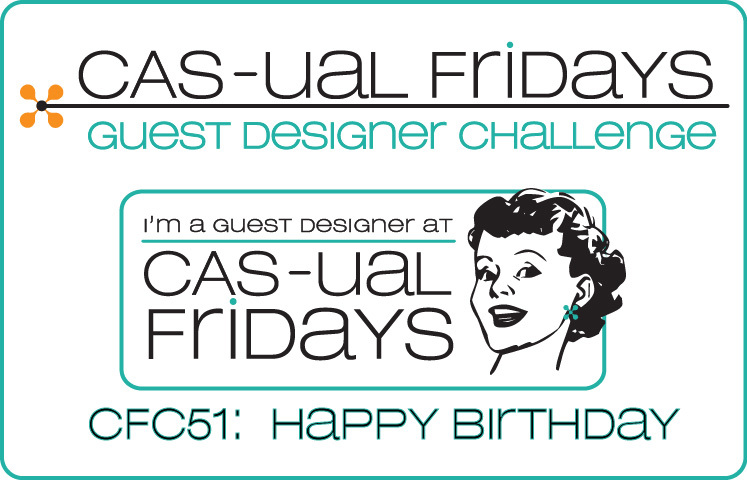 Happy Birthday Casual Fridays!! I always enjoy your challenges and I look forward to many more! Happy Birthday to you CAS-ual Fridays!! Happy Birthday CAS-ual Fridays, thanks for the constant inspiration!!! I cannot believe that a year has gone by! 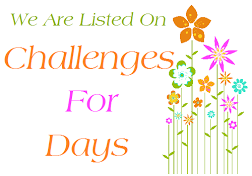 Great challenge blog and love the inspiration. Happy Birthday, and may you have many more! 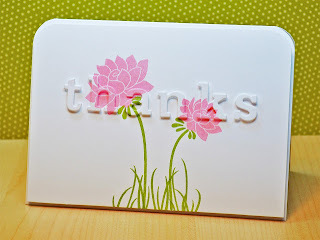 Love CFC and gorgeous DT inspirations....You all Rock!!! I'm late to the party but just wanted to say happy bday and many, many more. Love playing with you. And I had to say how much I loved the humorous cards (from Julie and Jenny)! One year? Seriously? Whoohoo! Many congratulations and best wishes for great challenges in the future! :) Wishing all of you on the team good times and fun! Fantastic inspiration from the team and the new Girl Fridays! Happy birthday!! Happy Birthday. Thought you may want to know so you can update: I Noticed that the 'How to Play' still indicates end of challenge as Wed 11:59 when it is now Thurs noon. Happy birthday! Can't believe you are only 1 year old! Happy Birthday, CFC! Way to keep it CAS! Happy Birthday to one of my favourite challenges. Love the new look, great team and superb inspiration cards. So glad that I was able to join in this week! Happy Birthday! Thanks for bringing us your inspiration and fun challenges every week!